As some of you may have heard (me blabber on and on about) my old friend Cathy has two kids getting married one month apart this summer! Knowing I make beach bags, she approached me about ideas for items she could put in a beach-themed gift basket for each of them. These will be presented at their bridal showers this spring. The beach theme was selected because they love the beach! 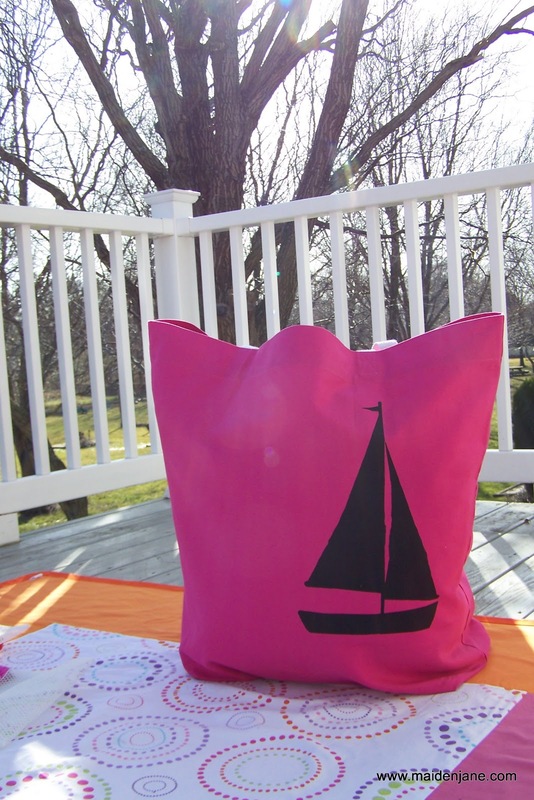 We started with two Oversized Beach Totes, one in hot pink and the other in orange. 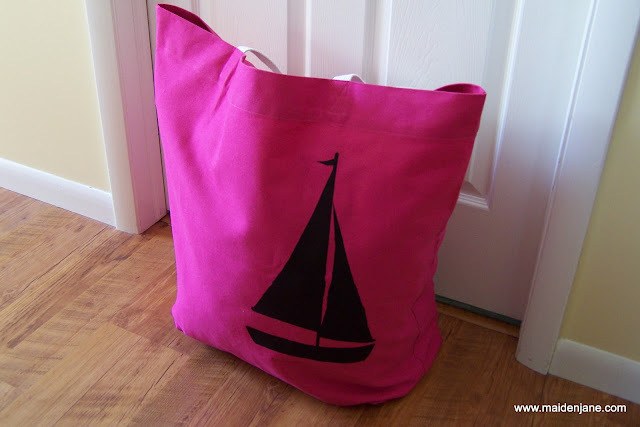 These sailboat bags are a special bag I made in collaboration with my friend Fiona of Fiona Designs. 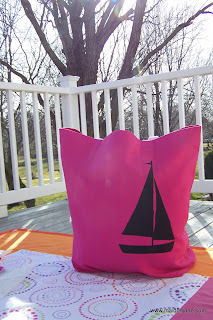 She has the most amazing shop and I asked her to design a sailboat for these sturdy bags. She made coordinating stationery to match. 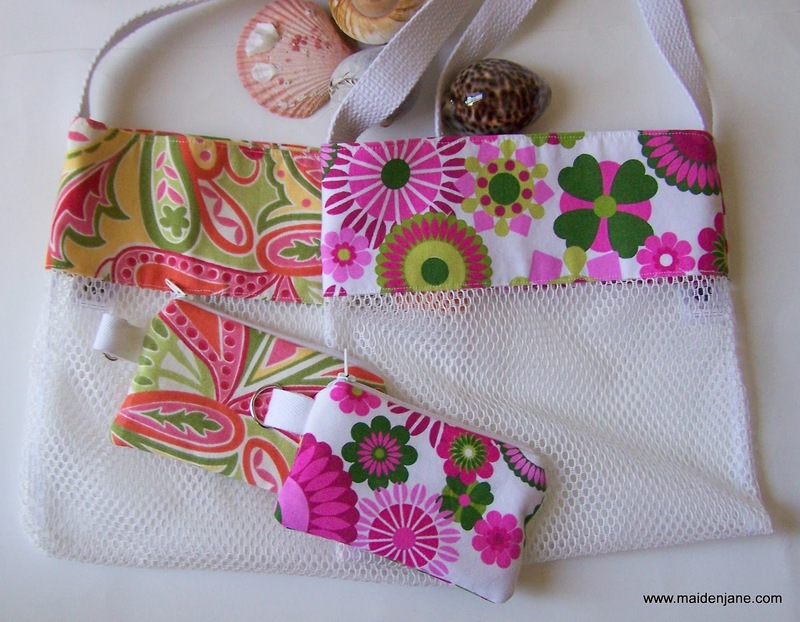 My friend wanted a sea shell bag and some kind of small, zippered pouch to keep cell phones safe from the sand. She also mentioned that she’d like to add a beach blanket if I had any ideas. 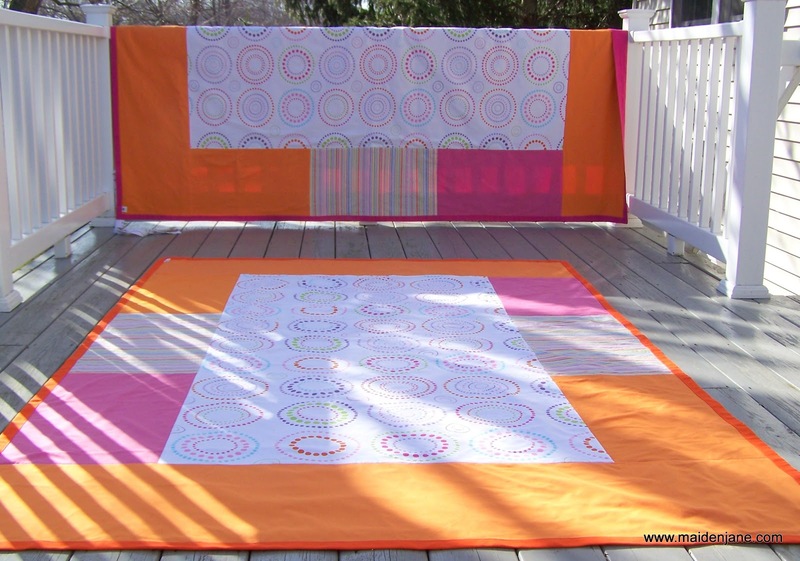 I started by finding some pretty floral fabrics in the orange and pink colorways. These were sewn into the sea shell mesh bags and small zippered pouches. And then the wrestling in my mind began. 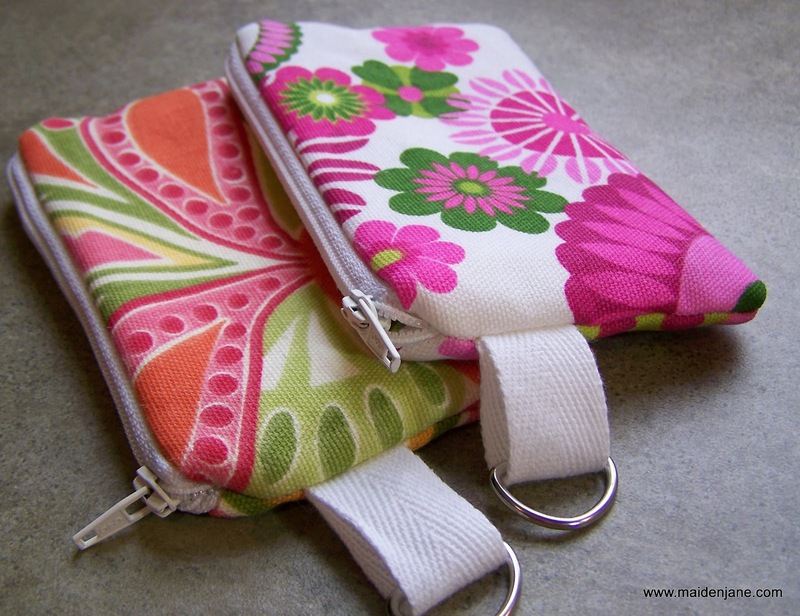 First, I thought maybe everything should be perfectly matched – so maybe I should go back and make new bags out of the floral fabric. Why do I let my mind play such silly games between doubt and determination? But all of these cycles help my mind stretch and develop ideas…. 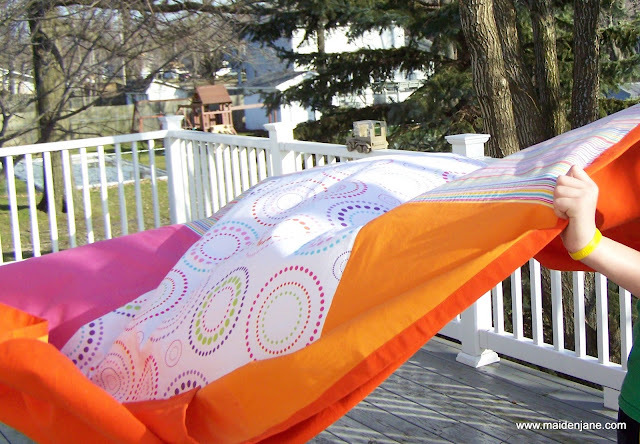 I researched ideas about beach blankets. (You can see my ideas in this post.) 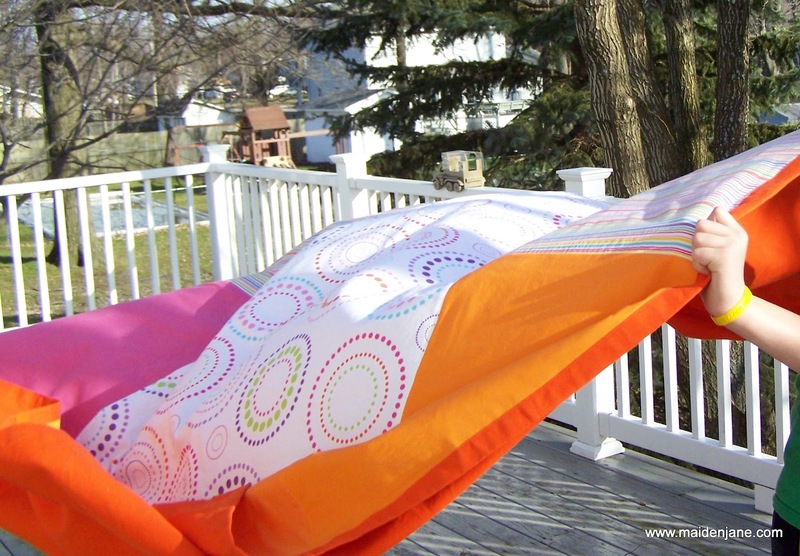 My Facebook fans said they liked sheets because the sand doesn’t stick to it. 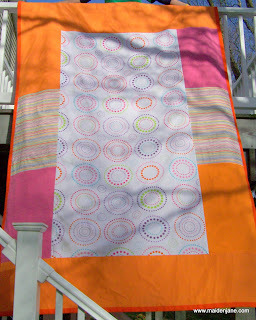 Of course, a traditional quilt would work, but it seemed like a large investment of time and money. I also wanted a big blanket. 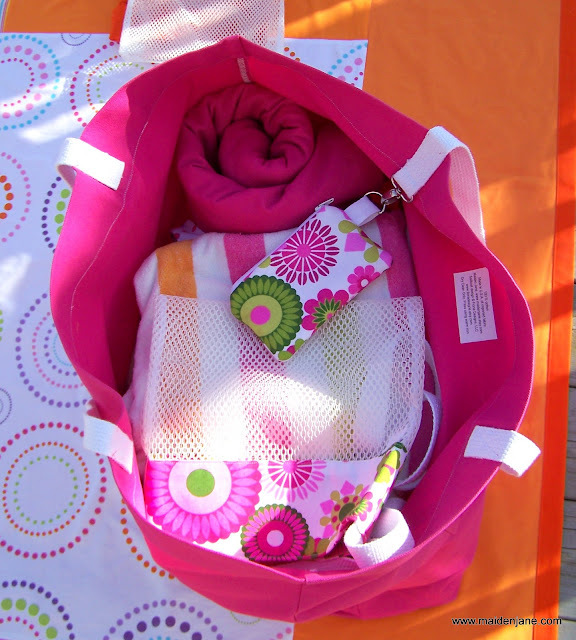 My personal beach blanket is never large enough – especially by the time we throw our towels and bags down on it. 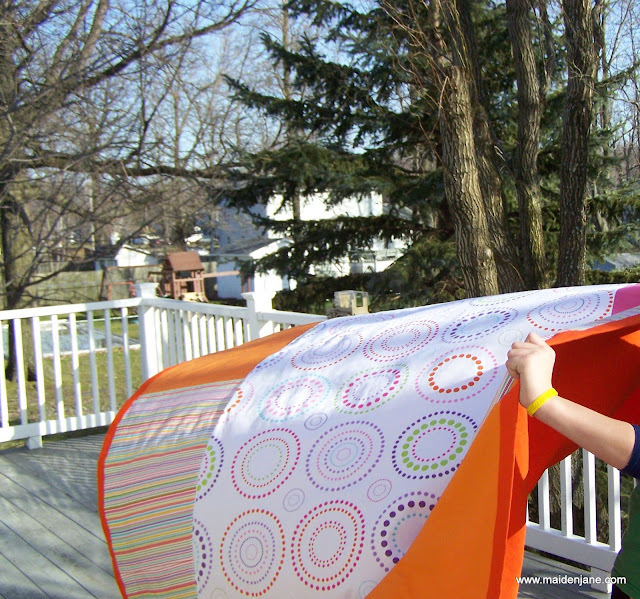 So I was aiming for something about twin quilt size. Doing some calculating, I was inspired to find some closeout pillow cases. 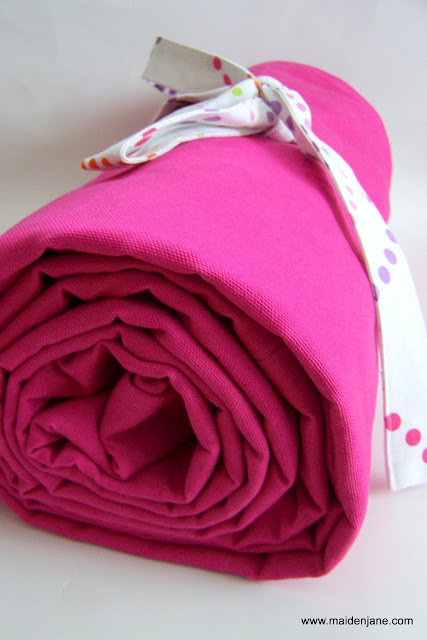 In my search at four stores, I found some sheets, pillow cases and some fabulous chino curtains, all filled with the pink and orange colors. The blanket is washable. 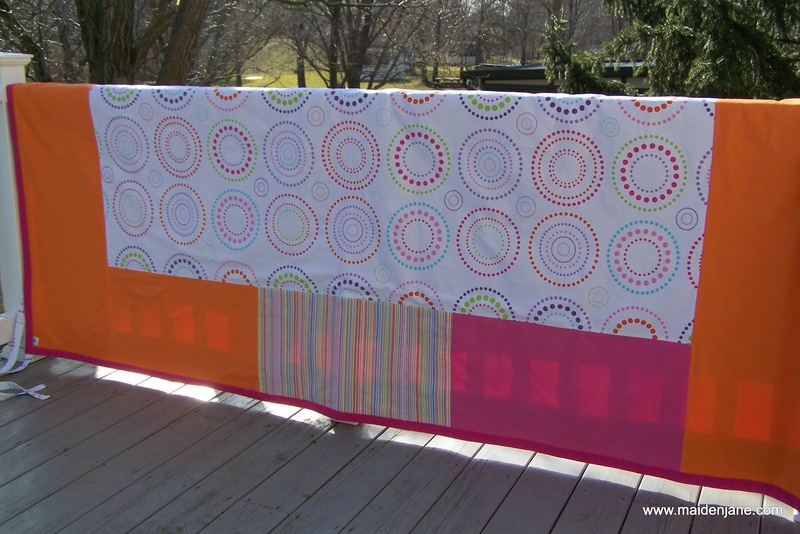 All the fabrics were prewashed and I prewashed the duck cloth twice to ensure that it would shrink. I told my friend that she will have to add a note that this blanket will have to be filled with lots of kiddos! 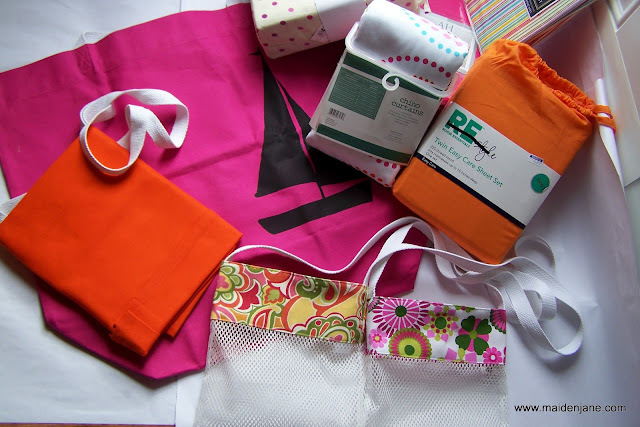 So all my friend has to do is add some colorful towels, a few other items and she has a great gift! 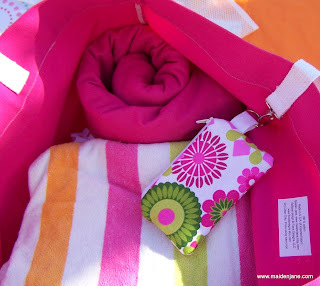 Here you can see inside the bag, where I have the beach blanket rolled up. Still room for several towels, sea shell bags and the small pouched clipped on. All packed and ready to go…..on a beach honeymoon perhaps? This project was a lot of hard work, but also a creative outlet for me. I love finding practical solutions to the problems my customers present. This has opened up my mind to a number of ideas about beach and picnic blankets. 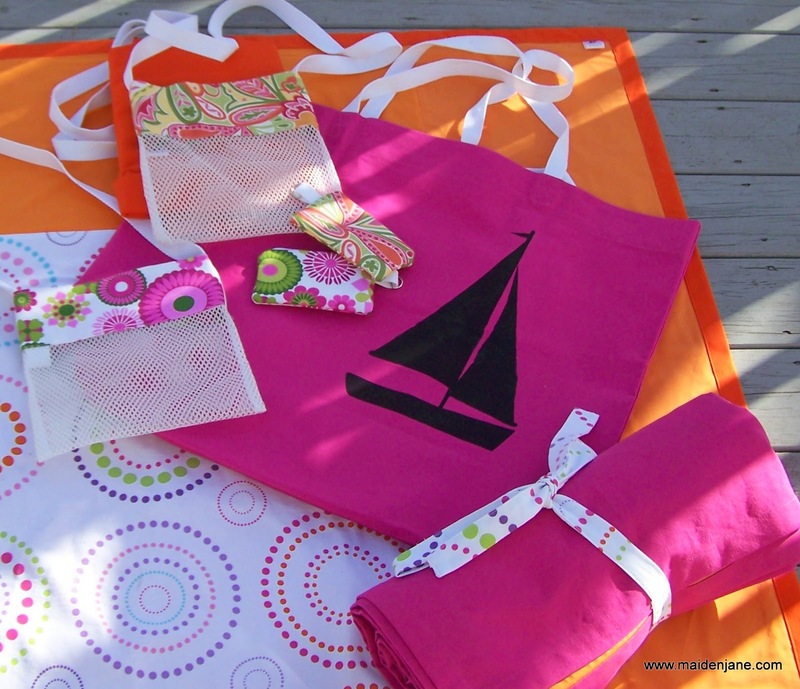 I will be offering a Custom Beach Ensemble in my shop! 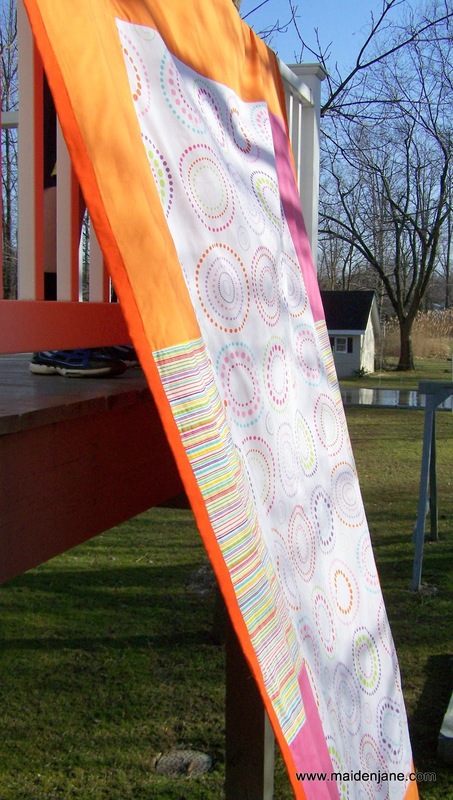 I think this would be a fantastic shower or wedding present as well as a great idea for families! As always, simply contact me if she have any special requests! 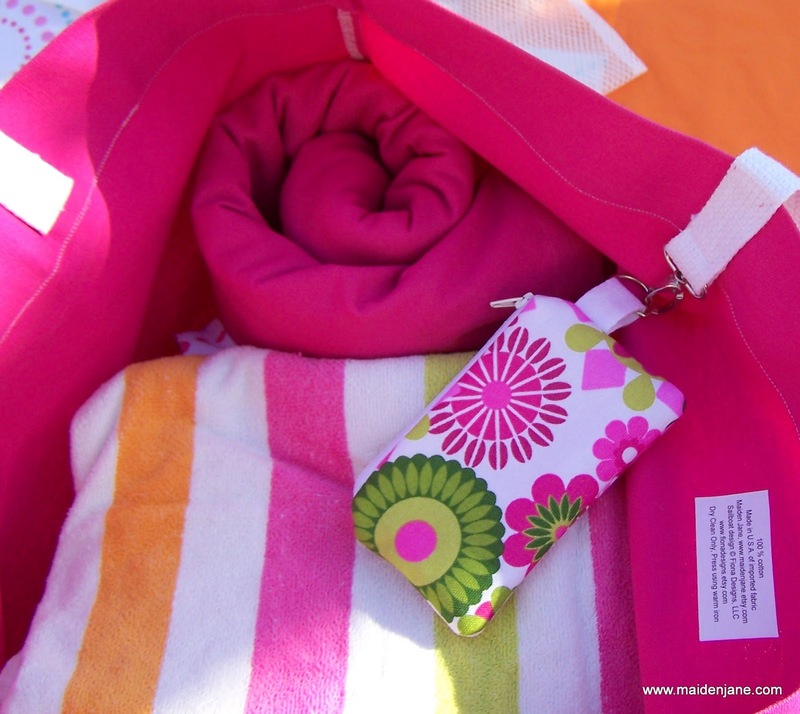 In the mean time, I’ll be dreaming about the beach…..
Oh Jane, I think the whole thing is fabulous!! What a great job. 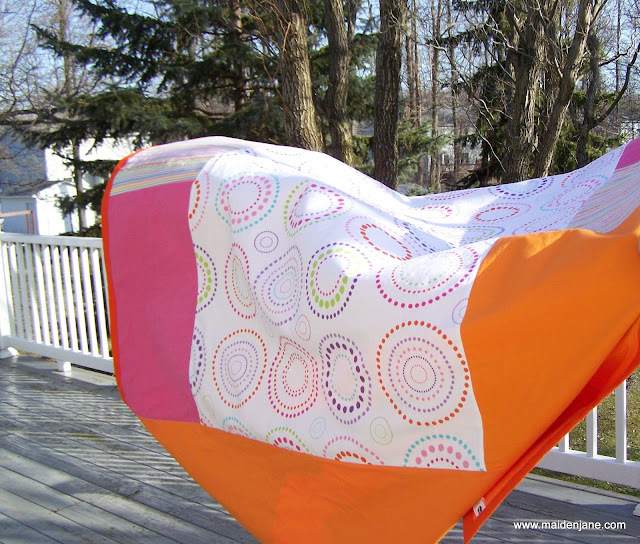 Love the colors and the way you put together the blanket. Love the coin purses and of course the shell bag! I love the blanket and all the matching goodies! Orange and pink are so much fun together! 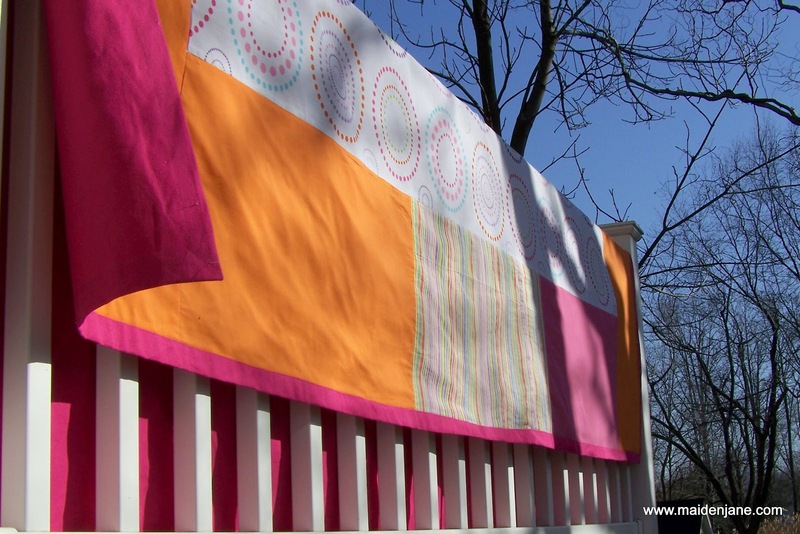 I love the color and the idea. I think I want to make a beach blanket from clearance sheets. I never even considered sheets. I like that you can have something very large but lightweight and compact. This one is particularly adorable. What a well thought out gift!! I just adore it! 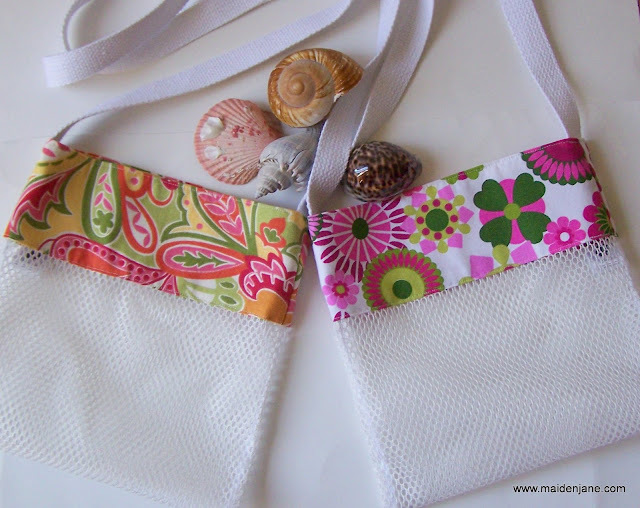 And the coin purses are so smart and the sea shell bags…..brilliant! Wow…what a great blanket. You’re right: towels are WAY too small to use as ‘blankets’ at the beach. This is beautiful. Love the colors too.